Brainstorm has been around for close to 19 years now, having been through quite a few lineups and now on their seventh full length album. Downburst sees the German power/heavy metal band continue the style they’ve had for their last couple releases by mixing more commercial friendly riffs with little to none of the cheesiness often found in the genre. It works well, and though this band’s seventh release may not be their strongest its still worthy of your time. Downburst is unfortunately a bit of an uneven album for Brainstorm, who have often put together fairly impressive efforts. While there are a number of noteworthy tracks that feature extremely memorable riffs and in your face energy, one can’t help but feeling that there are just not enough of them. As an entire album this release is solid from start to finish, but some of the ideas and riffs just scream average when compared to some of Brainstorm’s back catalog. But considering that this band puts an emphasis on riffs and melody over speed, they are different enough for those who have become tired with power metal. 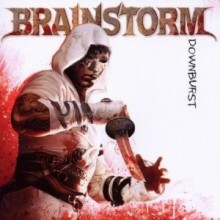 Though German power/heavy metal is notorious for having extremely cheesy vocals, Brainstorm should be credited for doing something different. Vocalist Andy B. Franck has a lower pitched singing style that sounds like a cross between earlier heavy metal and hard rock. Franck puts an admirable amount of power into his singing, helping to give Downburst the epic feeling needed for the best power and heavy metal groups out there. The lyrics are also noteworthy, as they are different from many of the themes that traditionally dominate the genre in this day and age. Overall, Downburst has its moments but they aren’t as frequent as one might like. The result is an album that is still worthy of many people’s attention, but is unlikely to be remembered as the group’s best. It’s still great to see a band as long running as Brainstorm continue to thrive though, as their sound still feels unique enough to attract many a listener. Not a must have, but a solid B-grade album to fill in time between the genre’s heavy hitters that are still likely to come later this year.